Barramundi are also known as Sea Bass, Barra, giant perch, giant sea perch, silver barramundi. The name Barramundi came from an Aboriginal word that means ‘large scaled river fish’. Barramundi are harvested as part of the set gill net fishery on the eastern coast of Queensland and in the Gulf of Carpentaria. They are also farmed. Barramundi are harvested as part of the set gill net fishery on the eastern coast of Queensland and in the Gulf of Carpentaria. They are also farmed. Available both wild-caught and farmed, it is caught using gillnets in coastal and fresh waters in Australia’s tropical north, from the Ashburton River in WA to the Noosa River in Queensland. They live in rivers and creeks, but do move into estuaries and coastal shallows to breed. Darwin, Weipa, Cairns, Innisfail, Townsville, Bundaberg and Adelaide are all important Barramundi farming centres. Queensland barramundi have a single annual summer spawning period, with the timing and duration varying between regions, river systems and from year to year depending on water temperature and salinity. Generally fish spawn around river mouths so that larval and juvenile barramundi can use swamps that form during the monsoon season. Annual wet season rainfall influences adult spawning success and juvenile recruitment. Juvenile barramundi are highly dependent on estuarine and freshwater habitats. They move from the estuarine areas up into the freshwater habitats to grow for one to two years. During the dry season, Barramundi may become land-locked in up river waterholes and lagoons of river systems. They move back to tidal areas when rains open these rivers. For that reason you find that in Australia, in areas that are heavily fished you are not allowed to keep Barramundi over 80 cm. It's catch and release so future generations of anglers will still be able to go Barramundi fishing. Did you know? Females produce a lot of eggs - about 300,000 per kg of body weight. The eggs hatch within 20 hours and grow quickly. Did you know? Barramundi are born as males and at about 6 years of age change to females. 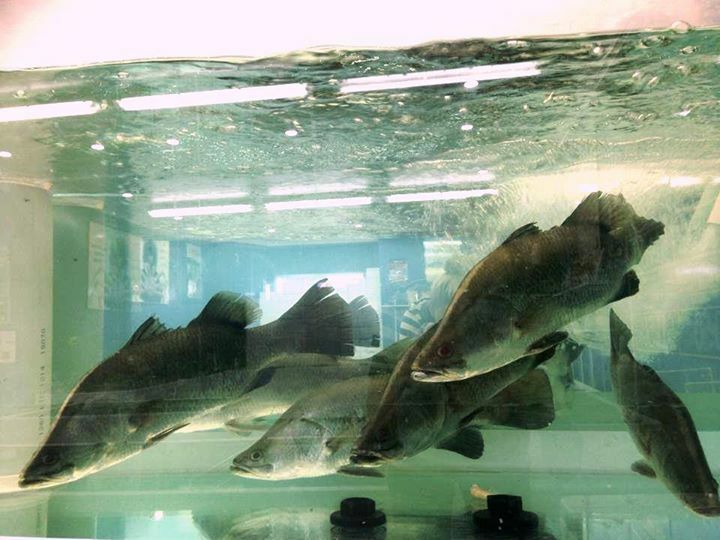 When Barramundi have reached over 80cm they are now female and ready for breeding. Barramundi are euryhaline, meaning they can live in both fresh and salt water. However, barramundi eggs and larvae will only survive in brackish or salt water (salinities between 22 and 40 parts per thousand (ppt)) and for this reason all breeding takes place in river mouths and bays near areas of suitable nursery habitat. Areas such as mangrove swamps and low-lying land that becomes flooded during spring tides and monsoonal rains provide ideal habitat for juvenile barramundi. Barramundi eat a range of food including fishes, shrimp, crayfish, crab and aquatic insects and they are mainly but not exclusively nocturnal feeders. Barramundi are a very important commercial species. They are excellent eating. The Barramundi is a big fish. It can weigh 10 to 20 kg and more, and a length of over 1 metre isn't uncommon. Its maximum size is 1.8 metres and it will then weigh about 60 kg. The name “Barramundi” appears to have become well used in Australia by the later part of the 19th century, however, the origins are not entirely clear. Barramundi Fishing: Barramundi are a premier game and sport fish , and they are prolific all across the Northern Territory and Kimberley coast. Their full range extends from Shark Bay in Western Australia across the top and down to the Mary and Maroochy river systems in Queensland. Barramundi flesh is white and moist with a medium to firm texture and fairly large flakes. The flavour is mild, subtle and highly prized. Barramundi are very versatile when it comes to cooking. Barramundi is well suited to all methods of cookery because of its moist texture and mild flavour. It is delicious when pan-fried, steamed, chargrilled or barbecued. Best served with leafy green vegetables such as baby bok choy and rocket. Barramundi Lates calcarifer, occurs throughout the South-East Asian region, including northern Australia. In South-East Asia barramundi is known as Asian sea bass and a successful farming industry, particularly in Thailand, has been established for many years. In the wild, they can grow to 180 cm total length (up to 60 kg) but farmed fish are usually sold at plate size (500 g) or around 3 kg (for filleting). Australian barramundi is farmed in diverse production systems. The majority of production comes from outdoor fresh or salt water pond operations and sea cages, in North Queensland, Western Australia and the Northern Territory. Government information, publications and website links for Barramundi. Australian Government Fisheries Statistics Links, Barramundi Farmers Association, Information on the Barramundi, Lates calarifer from Sea-Ex Trade Seafood Industry Directory.